In keeping with OnePlus tradition, this year's OnePlus 5 is an aggressively spec'd _phone_ that aims to be a more affordable alternative to the iPhones and Galaxies of the world, without too many compromises in build quality, hardware, and user experience. The OnePlus 5 is more of an evolution, rather than a revolution, building on top of an already established formula. 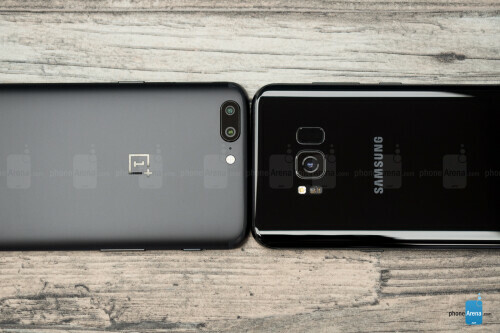 It is not a dramatic rethinking of the OnePlus _phone_ as a concept, but it does introduce a few interesting and noteworthy things of its own, and it also comes at a higher price than last year's OnePlus 3T. But even with the heftier price tag, the OnePlus 5 is still some $300 cheaper than the Samsung Galaxy S8+, and we're talking about the 128 GB of storage/8 GB of RAM version here. It is an absolute bang for your buck on paper, but can it actually compete with the best of the best? With that said, let's see how the OnePlus 5 does against Samsung's finest – the Galaxy S8+. You can't really talk about the design of the Galaxy S8/S8+ without mentioning the new “Infinity” display, since the phone's entire design is engineered around it, for better or for worse. Due to the new 18.5:9 display eating up so much of the phone's front side, there's little to no bezel left on the top and bottom of the device, which is one of the factors contributing to the S8's dazzling looks. 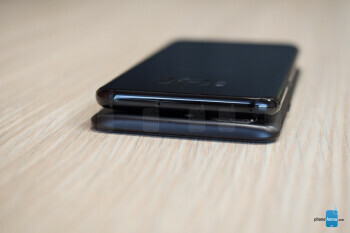 The almost non-existent "chin" under the display has also lead to an arguably major design change for Samsung and its Galaxy line of smartphones – namely, the separation of the home button from the fingerprint scanner and the re-location of the latter on the back of the device. Although we didn't have any problems reaching the fingerprint scanner on the back of either the S8 or S8+, some people around the office did not like the new placement of the sensor one bit, and we can certainly see why. If you have smaller hands, it could be an annoyance, but even if you don't, smudging away at the camera while trying to unlock the phone is pretty much unavoidable until you get used the scanner being right next to the lens. The OnePlus 5, on the other hand, features a more traditional industrial design with larg-ish bezels on the front, the bottom of which houses a fingerprint scanner/home button combo front and center with the standard Android navigation buttons to its sides. Unlike the almost all-glass S8, the OP5 has a full metal body with a matte finish, which contributes to its all-around lower-key looks, and it also doesn't attract fingerprints like crazy. Curiously though, we've found the OnePlus 5 to be one very, very slippery phone, so you might want to keep this in mind. While the OnePlus 5 has the S8+ beat when it comes to specs, Samsung's flagship is IP68-certified, meaning its water- and dust-resistant, and it also supports wireless charging and features expandable storage, neither of which traits it shares with the OnePlus 5. 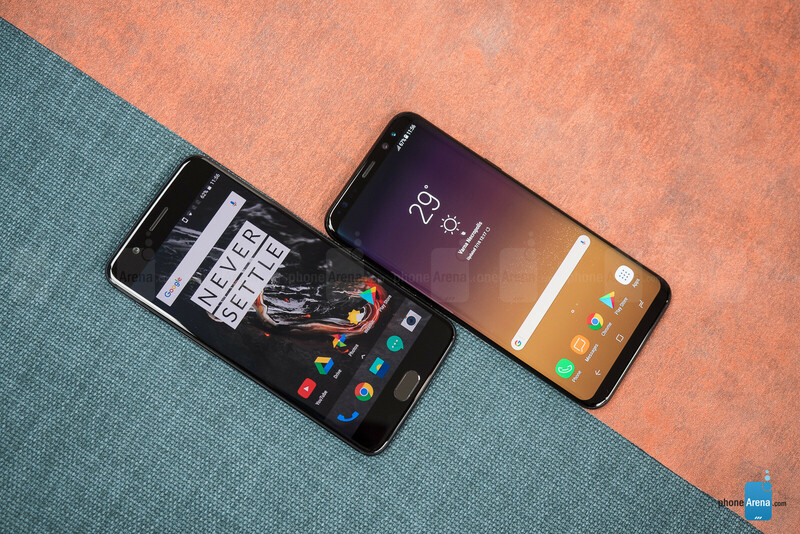 There's no contest here – the “Infinity” display on the Galaxy S8+ looks absolutely stunning and overshadows OP5's 1080p panel both in terms of size and resolution, as well as brightness. Well, to be absolutely fair, since the display of the S8+ is not in a traditional 16:9 aspect ratio, but rather 18.5:9, it is taller than OP5's 16:9 display, but it's also narrower, so it's not like its actual area is all that larger. When the two phones are held side-by-side, however, it becomes immediately clear just how much brighter S8's display is. While OnePlus 5's Optic AMOLED display is not bad per se, it can't hold a candle to the S8 when it comes to visibility under direct sunlight. Samsung's new display is one of the brightest out there. In keeping with OnePlus tradition, this year's OnePlus 5 is an aggressively spec'd phone that aims to be a more affordable alternative to the iPhones and Galaxies of the world, without too many compromises in build quality, hardware, and user experience. The OnePlus 5 is more of an evolution, rather than a revolution, building on top of an already established formula. 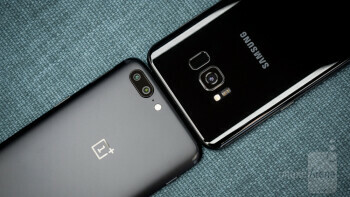 It is not a dramatic rethinking of the OnePlus phone as a concept, but it does introduce a few interesting and noteworthy things of its own, and it also comes at a higher price than last year's OnePlus 3T. 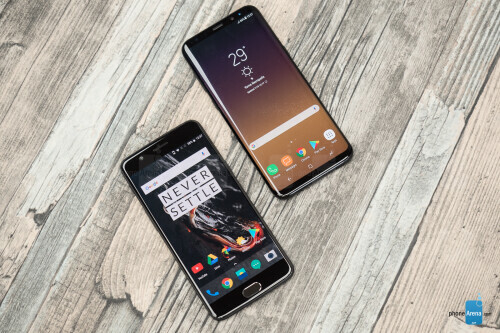 On the software front, the OnePlus 5 and the Galaxy S8+ are quite different. With the Galaxy S8 and S8+, Samsung has once again reworked its take on Android. 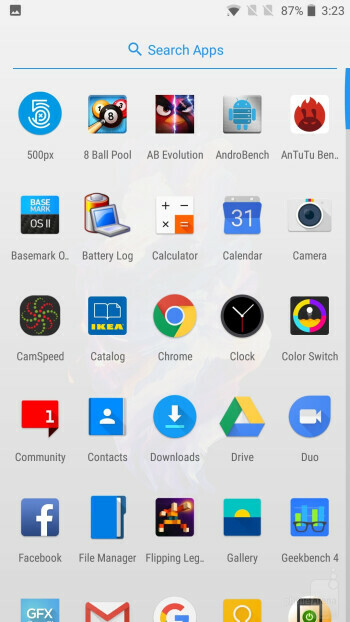 This time around, we're not dealing with any major functional shake-ups, but rather with something of a visual rethinking of TouchWiz. 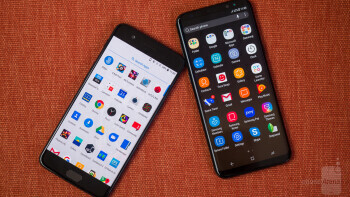 Now dubbed the Samsung Experience, the refreshed OS comes with an added layer of visual polish, but it does retain some its shortcomings, especially so far as performance is concerned. Samsung's reworked OS is as feature-rich as ever, but it looks sleeker than the TouchWiz of yore, more mature. Of course, since there's no hardware home button on the phone, one of the more immediate differences between the old TouchWiz and the new Samsung Experience is the presence of on-screen navigation buttons on the S8. 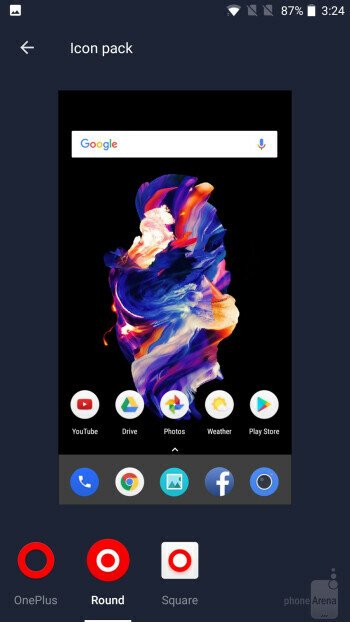 Thankfully, you can switch the position of the back and recents buttons if you don't like the default configuration, and you can also choose whether to have a solid black navbar or a transparent one, which is neat. The S8 and S8+ also come pre-loaded with Samsung's excellent Knox-powered Secure Folder app, which lets you separate and secure your data and clone apps for access with alternative accounts. Aside from all the cosmetic changes, the Galaxy S8 also prominently features Samsung's new AI assistant – Bixby. The OnePlus 5 is a very different beast when it comes to software. OxygenOS is a more straightforward take on Android, with a near-stock look to it. However, OnePlus' OS is anything but simple and grants its users a healthy dose of freedom for customizing the UI of the phone. 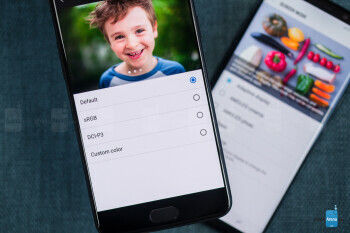 Not a lot has changed since the 3T in terms of functionality, although the latest version of OxygenOS features a new, built-in reading mode, a “Secure Box” file encryption feature, as well as auto night mode triggers, among other minor additions. One of the major changes that the OnePlus 5 introduces over its predecessors is a dual-camera setup that combines a regular wide-angle lens with a telephoto shooter. It is similar to the camera setup of the iPhone 7 Plus, in that it has optical zoom and can do a shallow depth of field simulation similar to Apple's “Portrait mode”. It's all good on paper, but it's a different story in practice. 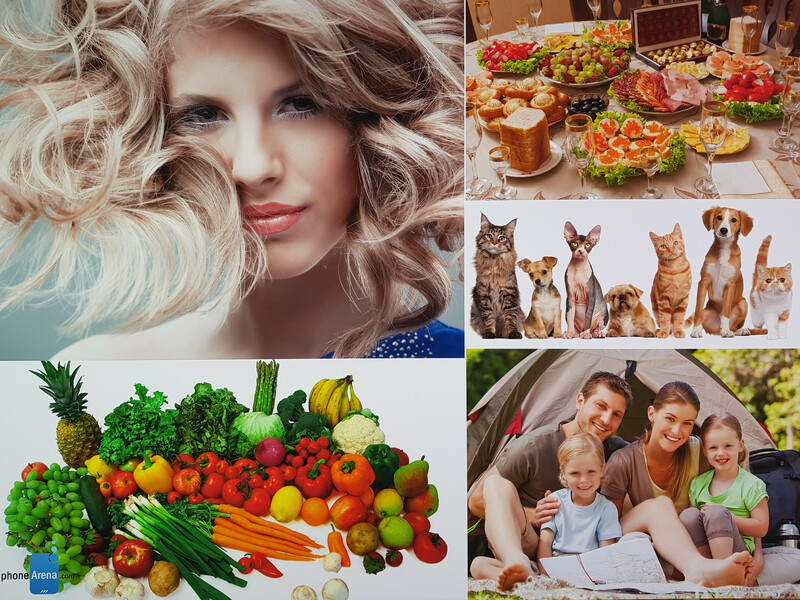 While we found the optical zoom to be a little bit better than on last year's iPhone Plus model, the same cannot be said for the main 16MP camera. It consistently underperforms when compared to the other top flagships and even feels like a step down from the OnePlus 3T, especially as far as video recording is concerned, since the 3T has OIS and the OP5 doesn't. The Galaxy S8+, on the other hand, has one of the best cameras currently on the market. 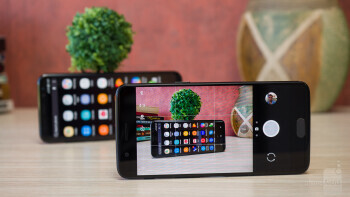 It performs great during the day, as can be expected, but also does an amazing job in low-light situations, producing detailed, noise-free images in lighting conditions in which most other phones would struggle greatly. This isn't to say that it doesn't have it's flaws—like its penchant for warmer tones and oversaturation—but this is a small price to pay for the actual performance that the S8's camera offers. 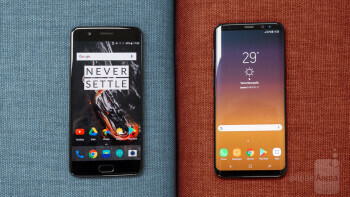 Both the Galaxy S8+ and the OnePlus 5 are powered by Qualcomm's current top-of-the-line processor—the Snapdragon 835— so neither is a slouch, but while the Galaxy S8+ comes with 4 GB of RAM on board, the OnePlus 5 comes guns a blazin' with either 6 GB or 8 GB of RAM, depending on your storage option of choice. One thing to keep in mind if you're going for the S8+, is that in some regions, like Europe and some Asian countries, the phone comes with Samsung's proprietary Exynos 8895 chipset, instead of the Snapdragon 835. 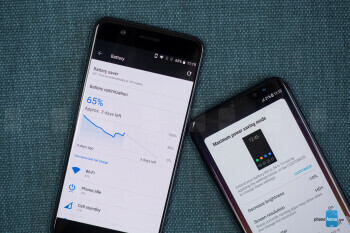 The Exynos versions of the S8 and S8+ score consistently better than their Snapdragon counterparts on benchmarks, although the difference is not noticeable during actual use. Another variable to look out for when buying an S8 is the type of obnoard storage it comes with. Some S8/S8+ units are equipped with UFS 2.1 storage, while others have the slower UFS 2.0. Unfortunately, it's a bit of a lottery, as there's no way of knowing which one you'll get before opening the box and checking for yourself. All said and done, no matter which version of which phone you choose, you'll be getting your hands on a very fast device. However, after using these two phones for some time now, we've noticed that the OnePlus 5 feels generally “snappier” than the Samsung. This doesn't really come down to the hardware differences, as they are both more than capable in this regard, but rather has more to do with the software running on both (but more on that in a minute). Still, the OP5 does benefit from the extra RAM in some ways and can hold more apps open in its memory at any given time without slowing down. Don't get us wrong, the Galaxy S8+ is no slouch either, and when it runs smooth – it does run really smooth. Samsung has put a greater emphasis on animations this year and the transitions from screen to screen, from app to app, are, for the most part, seamless and pleasant to look at. 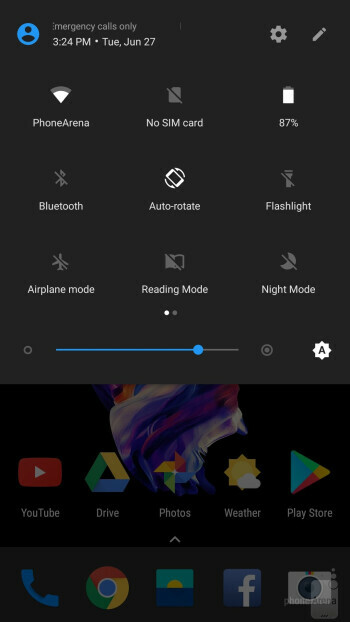 However, the Galaxy S8 does occasionally drop frames when interacting with the UI—even when performing such simple tasks as opening and closing the app drawer—and it does so more often than the OnePlus 5. The OnePlus 5, on the other hand, feels consistently snappy. 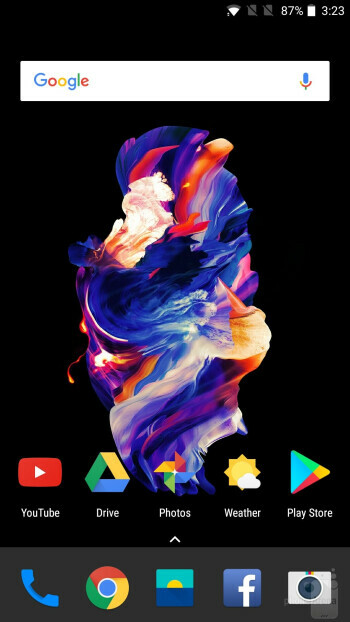 It doesn't try as hard as the S8 to wow you with cool animations, but rather strives to get them over with as quickly as possible. This has it's upsides, as navigating menus and apps feels lightning-fast, but it actually manages to feel a bit too fast at times. 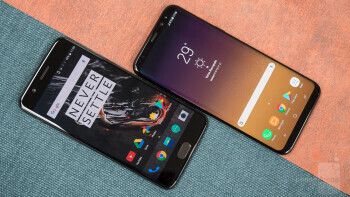 It occasionally seems like apps and menus are blinking in and out of view on the display, and although we'd take that over poor performance any day, OnePlus could have tuned its proprietary OS a bit more to improve overall fluidity. If you've followed the OnePlus 5 since launch, you may have heard of the so-called "jelly" scrolling effеct. It is a sort of a stretching effect that can be easily noticed when items on the display are moving vertically. It is not the biggest issue in the world, but it is most likely irreparable, since it is a result of the display panel of the OnePlus 5 being mounted upside down. Yup. 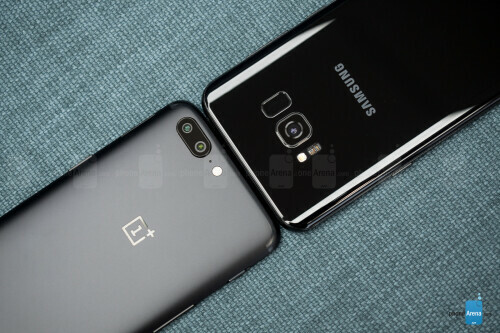 Apparently, according to a number of reports, the display panel of the OP5 is mounted upside down in order to make room for the new camera system. Unfortunately, this also causes the aforementioned jelly scrolling on every single unit out there. So far as consumption of visual media is concerned, the Galaxy S8+ has the upper hand with its high-resolution HDR-certified display. However, when it comes to YouTube, since most content out there is still in the 16:9 aspect ratio, you'll have to either settle for some letterboxing or use the crop-to-fill function. This is not the biggest hurdle in the world, but it's something to consider before buying the Galaxy S8+. When it comes to audio, the OnePlus 5 is equipped with a single bottom-firing loudspeaker and it does get pretty loud. It can perhaps make a bigger raucous than the Galaxy S8+ when you leave it on the table, but then again, Samsung's flagship also comes with a pair of capable AKG earphones in the box. They do a pretty good job, but are not the most comfortable in-ear type earphones we've tried. There’s nothing special to say about call quality with Galaxy S8+. There may be just a bit of getting used to, due to the earpiece being situated on such a thin piece of bezel, but it’s by no means an issue. Voices through the earpiece tend to sound OK. Call quality on the OnePlus 5 is solid. We had no issues on both ends: voices in the earpiece are sufficiently loud and clear, easy to recognize with their natural tonality, and the mic output is also crisp and clear, so callers on the other end will not have any problems hearing you. There's a 3,300mAh battery running the show on the OnePlus 5, which is a bit of a step back from the 3,400mAh cell on the OnePlus 3T. However, since the new phone is powered by the Snapdragon 835, which wastes less energy than the 821, it holds big promise for battery longevity. There is also no extra battery strain from the display – the OP5 runs on Full HD, not Quad HD resolution. The OnePlus 5 scored one of the best results of any flagship in our tests: 9 hours and 18 minutes of screen on time, trumping devices like the iPhone 7 Plus, Google Pixel XL, LG G6, and the Galaxy S8+. The S8+ is powered by a larger, 3500 mAh battery, but due to its bigger, more energy-hungry display, it doesn't do as good in our battery tests. If you're not willing to pay extra for Samsung's ultra flashy phone, then it should be a no-brainer – the OnePlus 5 is the one for you. 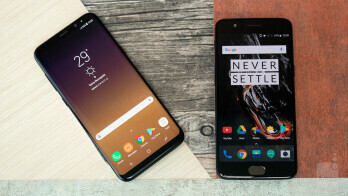 And even if you're willing to pay more, but you're not a fan of the curved screen on the S8+, or the new aspect ratio, the OnePlus 5 is still one of the best options out there, considering the price point. At $539 for the 8GB RAM + 128GB storage option, the OnePlus 5 is sure to appeal to many, but its shortcomings should be kept in mind. Although it delivers on the hardware front, offering stellar performance and lots, and lots of RAM (because where would we be without 8 gigs of RAM in our pockets? 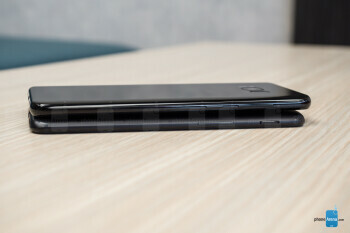 ), its camera is a mixed bag, even when compared to that of its predecessor. 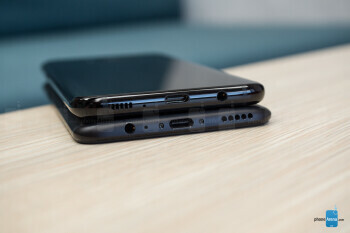 Further, OnePlus' decision to mount the display of the OP5 upside down, thus causing the whole "jelly" scrolling debacle, just boggles the mind. The Galaxy S8+, on the other hand, is a top-of-the-line device with ambitions (and price) to match. It does have its own issues as well, such as the occasionally iffy performance while interacting with the UI, but it is an all-around more polished package as a whole. And at its asking price, we would expect no less of it.